Government owned homes, better known as HUD homes, are an in demand type of property. Although originated With the Housing Act of 1937, it wasn't until 1965 that the Department of Housing and Urban Development (HUD) grew its roots. Since then, HUD's mission has been to develop strong and sustainable homes. HUD's goal is to strengthen the housing market to aid in boosting the economy and protect consumers. Available properties owned by HUD are a result of an FHA (Federal Housing Administration) home loan that was foreclosed on. When someone with an FHA insured mortgage is unable to make their payments, the mortgage lender forecloses on the property. FHA then pays the mortgage lender what is due and then HUD acquires ownership. These properties are then appraised and listed on the market. There is a subtle difference between a HUD home and a bank-owned home. Both type of properties went through the foreclosure process. However, the primary difference as mentioned above is, a property previously purchased with an FHA insured mortgage, reverts back to HUD. Whereas, a property not purchased with an FHA insured mortgage remains with the lender, which then becomes a bank-owned property. Where are HUD Homes Located? HUD homes are not located in any specific area. They are randomly available in many Rio Rancho neighborhoods such as Enchanted Hills, Cabezon, Northern Meadows, River's Edge and other Rio Rancho subdivisions. Buying a Rio Rancho HUD home is really no different than buying any other type of property. You can perform any applicable home inspections and you can close in approximately 30-45 days from the date of offer acceptance. There are no special requirements outside of general loan qualifications to purchase a HUD home, except for home buyers that wish to take advantage of available incentives offered by HUD (See Incentives). Making an offer on a HUD home is slightly different than an offer submitted on other properties. A bid is submitted directly to HUD via their online portal. The first thing you will need is to get prequalified for a home loan. This will determine your buying power and which programs you can utilize. Next, you'll need a Rio Rancho real estate agent who is registered with HUD. Bids can only be submitted by a real estate agent. We are registered with HUD. If you need to submit a bid before a deadline, call/text us at (505) 730-8181. While the term "bid" is used, it isn't quite like a typical auction. Basically, home buyers generally have one shot to submit their highest and best offer. Within about 24-48 hours from the bid deadline, all parties are notified of their bid status. In a multiple bid scenario, the status for the winning bidder will update to "AC" (Accepted). The status for the non-winning bidders will update to "OBS" (Other Bid Selected). The winning bidder will then have 48 hours to submit all the required documents and items to HUD's designated asset manager. There are a few incentives that home buyers can take advantage of when purchasing a HUD home. 1) Unlike short sales, you can close and move-in with a HUD home in approximately 30-45 days from the date of bid acceptance. 2) HUD homes have already been appraised and have had a termite inspection. This can save you approximately $500+. 3) You could qualify for the $500 down payment program. 4) You can request from HUD up to 3% of the purchase price towards your closing costs. 5) HUD homes offer a Property Condition Report. The report can describe the condition of the property with regard to the functionality of the plumbing, electrical, heating/cooling, etc. The Property Condition Report should not be used as a sole source of the property's overall condition. It is strongly recommended to have all applicable home inspections performed on the property. HUD homes can be purchased for investment purposes. However, during the exclusive listing period, owner-occupants have priority. Once the exclusive listing period has ended, investors can bid on the home. There are two primary ways to find HUD homes. 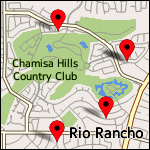 First, we can do the work for you and locate Rio Rancho HUD homes based on your specific criteria. Second, you can utilize our free listing alerts service to have e-mails sent to you the instant HUD homes that match your interests hit the market. You'll know about available homes before most real estate agents do. Feel free to call/text us at (505) 730-8181 or e-mail us with questions regarding new construction homes. Remember, there is no cost to you for our assistance with buying a home from a home builder. The builder pays for our services, so take advantage of side-by-side assistance with locating a new home, obtaining all available benefits and contract negotiations.